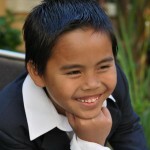 Singing Sam Santiago Sensational Seven Year Old! Sam Santiago is not only unbelievably talented but has one of the most amazing vocal abilities that I have ever seen in a 7 year old boy! Only a few days ago while visiting Facebook, I took notice of a post by Sam Verlinden of a young man that immediately captured my attention. 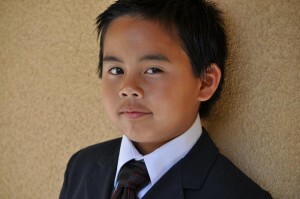 He is, seven year old Sam Santiago. What really charmed me was his vocal quality along with his charismatic personality which really shined through while singing his song. It took me only moments to publish his video to the video of the day list and contact his parents for an article. I am delighted to introduce to you this young performer, who is not only well ahead of the game with his vocal talent but already a star performer who is becoming more and more in demand in both California and the Philippines. Sam started singing when he was about four years old. His family moved to Corona from Mission Viejo when he first began to show an interest in music. Stuck in traffic with not much to entertain him but Mom, his brother, and the radio, led Sam to find his singing talent. Kelly Clarkson and her hit singles “Since You’ve Been Gone” and “Because of You” were his favorite songs. As he continued in his new found talent, Sam realized that Kelly was truly his idol at that time. At school, Sam was still stuck in his own world of singing. His kindergarten teacher was really amazed with how well he sang during his free time. There was an assignment that she gave that had to deal with what everyone in the class wanted to be when they grew up. Sam’s answer was simple, “a rock-star, and a pastor”. Sam’s 2nd grade teacher emailed his mom because she always caught him singing or humming in the class which distracted other students. Sam started taking vocal lessons with Thomas Appell in October of 2009. 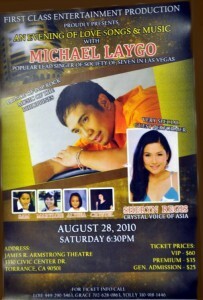 Since that time, his voice has greatly improved and become even more enhanced. In addition, Thomas was very instrumental in teaching Sam how to hit the high notes with ease and use vibrato. Sam’s family abroad wanted to hear him sing so his parents decided to upload videos on YOUTUBE and that’s when his popularity really took off. Sam explained, “My dad submitted a YOUTUBE audition to AMERICAS GOT TALENT. ‘This was very exciting because AGT replied in no time and sent us the paperwork to start the process. Unfortunately, two weeks later AGT brought up licensing problems on song writer and track clearance.” Even though Sam’s parents worked hard to get all this done (new songs and new tracks), unfortunately none of them were cleared. They decided to just sing another song “You Light Up My Life” w/ piano accompaniment by his vocal coach. (Sam had never heard this song before but he got it down in Five hours of practice and recording) Once recorded, the family tried desperately to upload it right up to the last two hours of the due date. Sam just qualified for the simi-final round in the O.C. 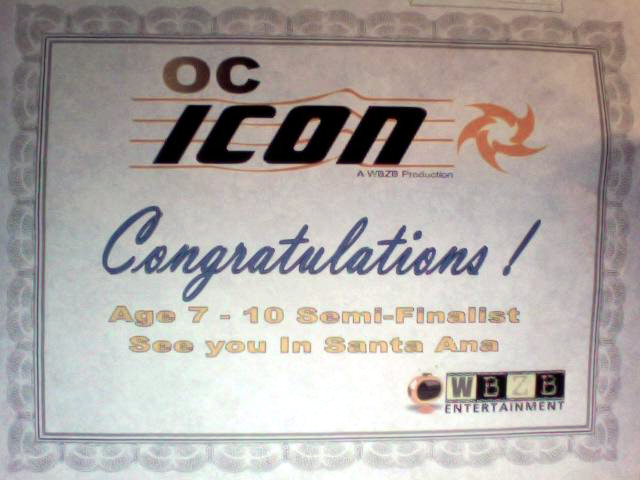 ICON Vocal Competition being held in Santa Ana, California on August 15th. Be sure to stay tuned for updates about this event! Were pulling for your Sam! Dylan, It is so nice of you to always leave a comment and encouraging word for the younger kids on the site! Your an amazing young man and I wish you all the best for a successful future in music! Wow!!!! so young and so good already….your going to be amazing!!! Thank you so much for introducing me to young Sam! He truly is amazing and I look for him to accomplish great things in the future! All my best to you, your family and especially to your Sam! Previous Previous post: Allan Clelland Goddard Moving to Sunshine State! Next Next post: Anthony Gargiula Eleven Year Old Show Stopper!